It was always a difficult task to search old photos in your email box that you received as email attachments. And it take so much time to find the one that you are looking, Now you can easily recover all those photos with few click from your email account. Yes it is possible with Lost photos app, which allows you to find any photo you’ve ever sent or received stored in your email account. 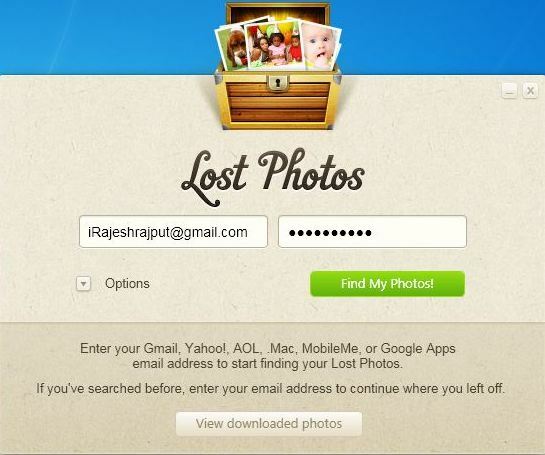 Lost Photos, a free desktop app, retrieves photo from most popular email services, including Gmail, Yahoo, AOL, iCloud/MobileMe and Google Apps account. 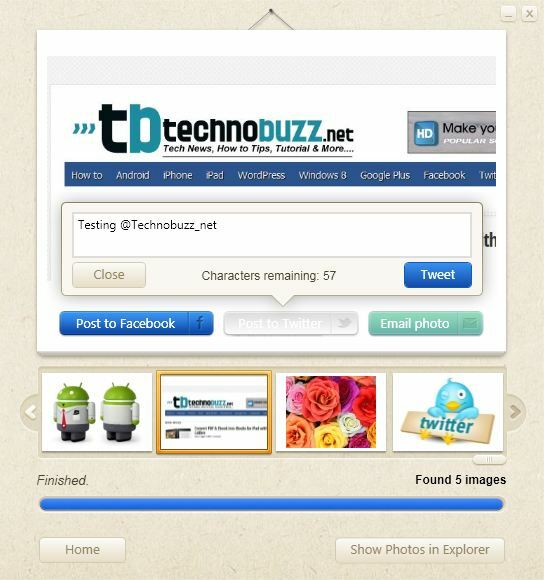 Also it gives you options to post those selected images to Facebook or Twitter, send them as emails easily. 1. 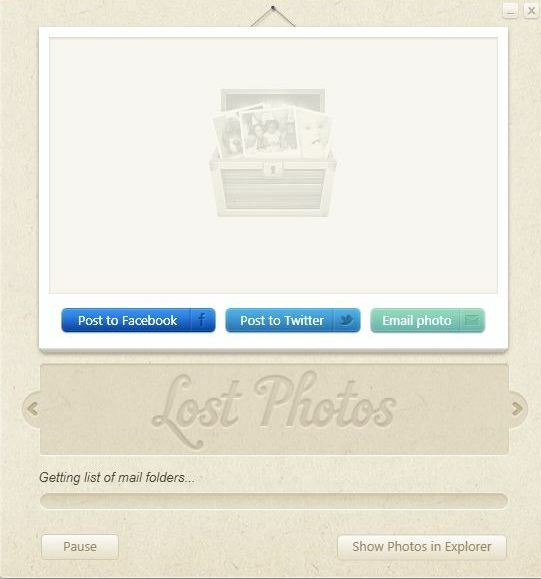 Go to the Lostphotos home page and install the app on your desktop. Now run the app and sign in with your account using your email address and password. 2. 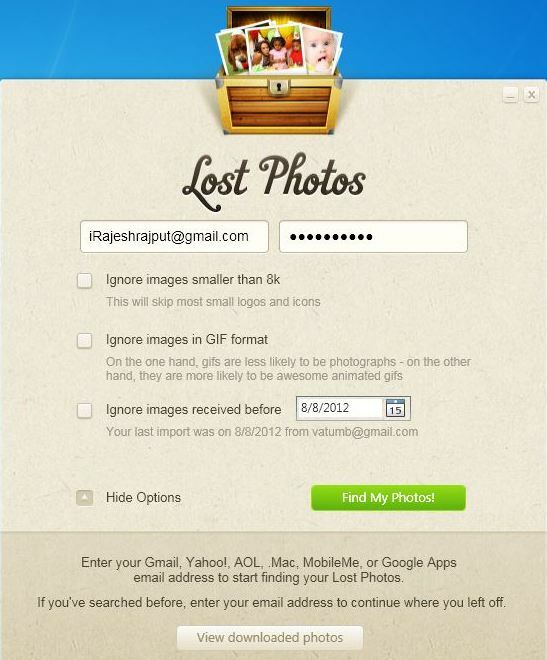 It also give you the option to search the images on your email, Lost Photos: Search For & Download All Images From Your Email Accounts, from here you can ignore gif file and images below than 8k size and set up a date criteria for searching the photos. 3. Once you select the options, then click Find My Photos! The process will likely take some time, especially if the account is more than a year old. 4. 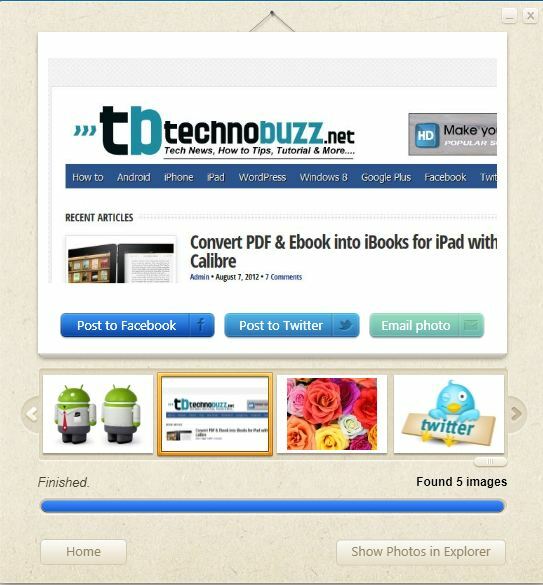 Once the process is complete you can see stream of thumbnails on the app windows, select any one to pen it or you can click to share any individual pic on Facebook, Twitter, or e-mail. If you want to see all the pictures on the windows explorer then hit the Show Photos in explorer option from the below right corner. 5. Now you have all the lost photos, you can also share all the recovered images directly to Facebook, and Twitter, or Email them to your friends. 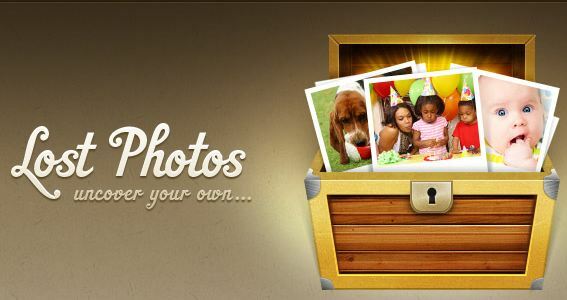 Lost Photos is also available on the Mac App Store, but you have to pay $2.99 to use it, Foe windows user its totally free and you can download it from the link given below.